This is a beginner’s introduction to the iPad for teachers, demonstrating the basics about navigating through the settings, using the iPad, how to connect to wifi and some basic tips and trouble-shooting. You will also learn about iPad Accessibility features that can assist students with learning difficulties and some simple cross-curricular apps and how they can be used in the classroom. This course is ideal for teachers who are new to the iPad and want to become familiar with it, so they can incorporate iPad technology into their teaching for increased engagement and learning. It will be deliberately flexible to allow for individual learning needs. This is a short 2-hour course and would be ideal to be run at your school or even in a staff meeting, so you can learn how iPads work on your school network. It can be run off-site by request. 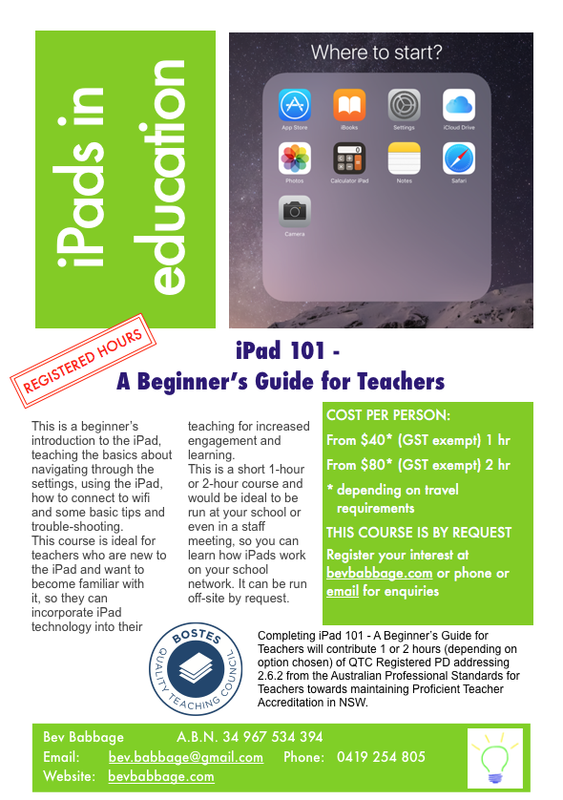 Completing iPad 101 – A Beginner’s Guide for Teachers will contribute 2 hours of NESA Registered PD addressing 1.6.2 and 2.6.2 from the Australian Professional Standards for Teachers towards maintaining Proficient Teacher Accreditation in NSW. From $90 per person (GST exempt), depending on travel required. Minimum numbers will apply. If your school prefers to pay by cheque, I can send an invoice. An iPad with wifi capabilities, preferably with the most recent IOS update. Yes! This is an introduction to the iPad, concentrating on the basics of using the iPad and understanding its capabilities in an educational setting. While it will show how to use some apps, it is primarily about using the iPad itself.